An important, interactive classroom routine through which the teacher reads out a story out loud to their students. Students may be passive while they listen, or engaged by following along and answering periodic questions. Dramatic representation of a story by readers. A form of dramatic presentation through which readers develop fluency. 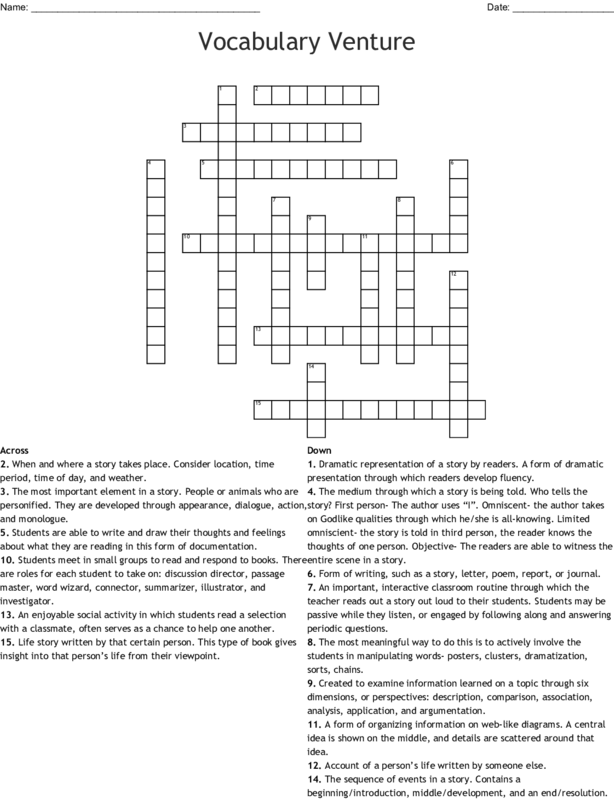 An enjoyable social activity in which students read a selection with a classmate, often serves as a chance to help one another. Students meet in small groups to read and respond to books. There are roles for each student to take on: discussion director, passage master, word wizard, connector, summarizer, illustrator, and investigator. The most meaningful way to do this is to actively involve the students in manipulating words- posters, clusters, dramatization, sorts, chains. The sequence of events in a story. Contains a beginning/introduction, middle/development, and an end/resolution. The most important element in a story. People or animals who are personified. They are developed through appearance, dialogue, action, and monologue. When and where a story takes place. Consider location, time period, time of day, and weather. The medium through which a story is being told. Who tells the story? First person- The author uses “I”. Omniscent- the author takes on Godlike qualities through which he/she is all-knowing. Limited omniscient- the story is told in third person, the reader knows the thoughts of one person. Objective- The readers are able to witness the entire scene in a story. A form of organizing information on web-like diagrams. A central idea is shown on the middle, and details are scattered around that idea. Created to examine information learned on a topic through six dimensions, or perspectives: description, comparison, association, analysis, application, and argumentation. Students are able to write and draw their thoughts and feelings about what they are reading in this form of documentation. Form of writing, such as a story, letter, poem, report, or journal. Account of a person’s life written by someone else. Life story written by that certain person. This type of book gives insight into that person’s life from their viewpoint.